We had one goal for this trip: See Schwerin Castle. But, considering it is hours and hours away from us (6 to be exact) we had to incorporate some other stops to make the trip worthwhile. We chose Hamburg as our home base and to break up the drive we stopped at Hanover which was right on the way. Our first glimpse of the city after parking was the lovely opera house. Hanover's neoclassical opera house was completed in 1852 and originally served as the court theater. Nowadays it is almost exclusively used for opera. After being gutted by fire in a 1943 air raid the building was restored in 1948. Hanover is best known in Germany and around Europe as a trade-fair center with up to 800,000 business visitors a year. Wow! But, the history of the city is much more than huge conventions. 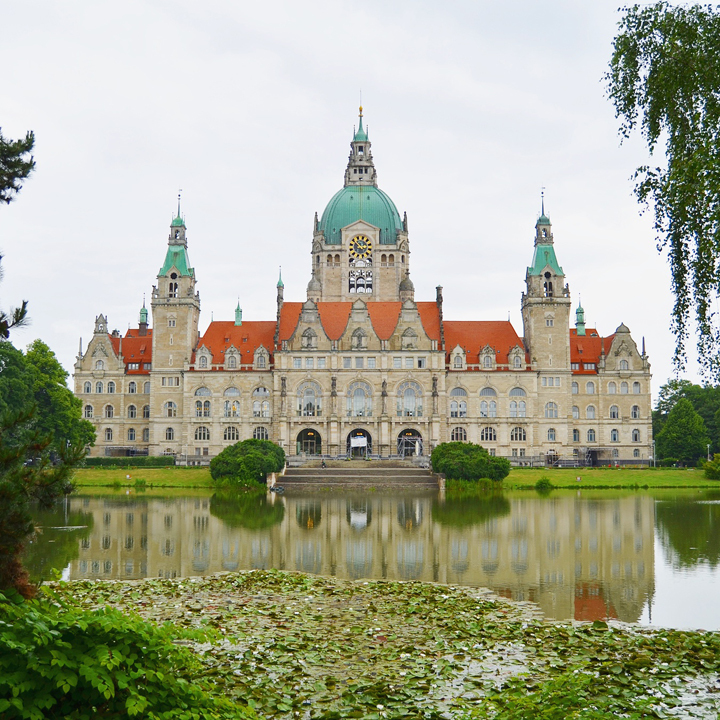 It is a state capital (of the German state of Lower Saxony) and from 1815 to 1866 ruled a kingdom in its own right. Unfortunately, 80 air raids during the war leveled 90% of the city center so much of the city is new and modern. Thankfully, some historic gems survived, including the Altes Rathaus (Old Town Hall). It took nearly 100 years beginning in 1410 to build this gabled brick edifice. The nearby Marktkirche is the southern most example of north Germany's love affair with Gothic brick. It is the heart of what is left of the Altstadt. The church's mighty tower rises up 90m then is topped with a pinprick spire. The interior was thoroughly scrubbed clean of decoration during various Reformation purges, but a lovely altar was spared. A statue of the great German reformer Martin Luther stands watch outside. Hanover's old town was once extensive and characterized by the shadowy lanes and half-timbered buildings still found in many German towns. But, the ravages of war took their toll. Today the old town is made up of about 40 half-timbered structures. Looking down towards Hanover's oldest church, the Kreuzkirche. 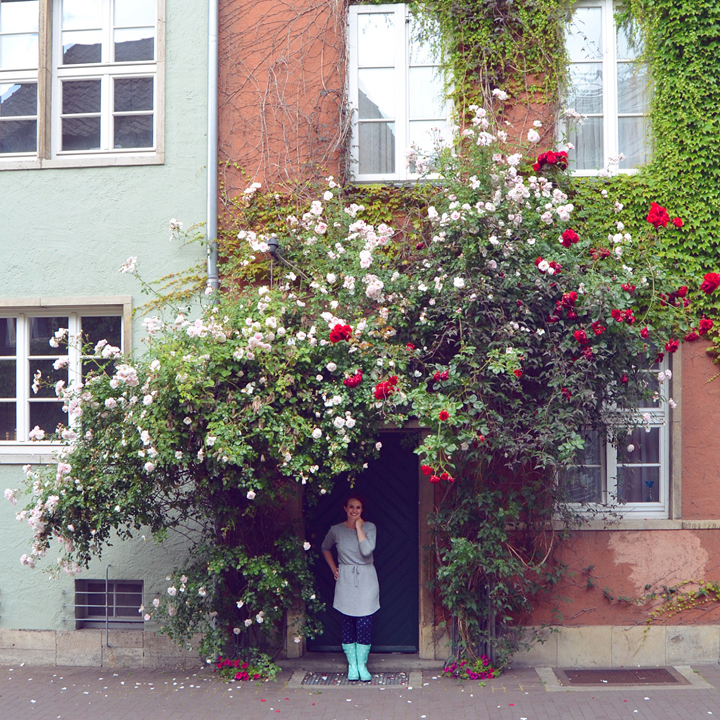 I absolutely loved this doorway with the flowers growing all around it. Wow. Just, wow! There were cool architectural details on this building. We passed by the Leineschloss which is currently home to the parliament of Lower Saxony. Walking in the rain. The weather did not cooperate for us during our stop in Hanover. But we were prepared and made the best of it. Just down from the parliament, the Lower Saxony State Museum is housed in a superb neo-Renaissance building built in the 19th century. The museum features a large collection of artwork, statues, and artifacts from the medieval period right through the 20th century. The park near the New Town Hall is gorgeous, lush, and green. Finally we reached the architectural highlight of Hanover: the Neues Rathaus. Built at the start of the 20th century in the Wilhelmine style (named for Kaiser Wilhelm), the pomp and circumstance were important ingredients of the heavy German bureaucracy of the time. The Kaiser was so impressed by by the building that he officiated the opening in 1913. On our walk back to the car we saw this church ruin. Heavily damaged during WWII, the roofless remains stand as a memorial to the war. Crazy facade to a parking garage. Hanover was a fun stop and a great place to see on our way up north. The Evans Family in Hanover, Germany in front of the New Town Hall on Friday, June 19th, 2015. We loaded back up in the car and then we drove to Hamburg! Recap post coming soon. Yay!! I lived in Hannover for 3 years between 2003 and 2006 and still have connections to that city. Always feels like home when I get back for a visit. Glad you liked it! Great pics Paige! I LOVE that cute elephant! And mean people stink...don't let them ruin your trips!! You are living the life that I want to live...I love love love Germany! Too bad it rained on your guys, but the photos are amazing nevertheless.